The Lehigh River is another rugged Pennsylvania waterway we specialize in. It originates from a series of glacial bogs on the PoconoPlateau at an elevation of 2,100 feet and flows into the Delaware River at Easton, PA - elevation of 200 feet. The upper portion of the Lehigh is considered a coldwater, freestone stream and has that characteristic Pocono tannic stain. Water is supplied to the Lehigh from three sources: snow melt, rain and feeder streams. When worst case scenarios come together, flooding has been a problem in the past along the Lehigh. Therefore, the idea was born in the early 1960s to construct Francis E. Walter Reservoir (FEW) above the town of White Haven. Built by the Army Corp of Engineers (ACE) in 1962 as a flood control reservoir, FEW is constructed of earthen rock, reaches depths of approximately 200 feet and is equipped with a bottom-release. Like most rivers and reservoirs controlled by the ACE, there are environmental management issues that could be improved in our minds that would greatly enhance the fishery. However, what we currently have is a fantastic fishery for our cold-water friends. But it could be better!! Downstream of the dam, just south of White Haven you have the Gorge and its many coldwater tributaries. This setup quickly swells the Lehigh into a large and foreboding river by east coast standards. These coldwater tributaries are also what maintain the rivers temperatures and allow the trout to holdover extremely well during the warm weather months. From the bottom of the Lehigh Gorge at Glen Onoko to the town of Lehighton, the Lehigh still maintains its burley nature with long, heavy-white-water rapids, large rocks, pocket water and deep pools. In the Lehighton to Bowmanstown stretch the river decreases in gradient, but it still has some class III rapids. In this stretch we tend to find a combo of deep pools and steep banks. This setup can provide decent dry fly fishing during a hatch. From Bowmanstown to Walnutport the river begins to decrease in gradient. There are still some heavy whitewater rapids but not near the length as upstream. What we do find are pools that are long and deep, which provide the angler an opportunity to target large trout slashing at emerging caddis or sipping mayflies from the surface film. From Walnutport to Northampton, the river maintains its character but begins to warm even during the wettest of summers. 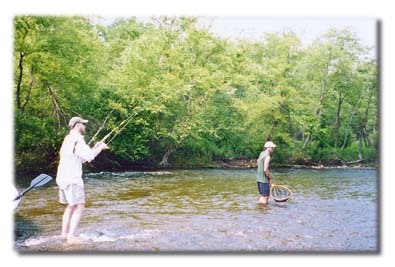 Walnutport is what we consider the bottom end of the prime trout water. All of the above is water we float in a 16' ClackaCraft driftboat. The Lehigh is home to many different species of fish. Brown, Rainbow and Brook trout are the most sought after species. 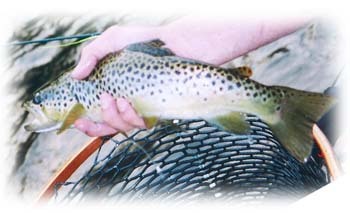 Brown and Rainbow trout grow big in the waters of the Lehigh. Each year the river produces plenty of fish over 20" and fish in the 14-18" range are the norm. Besides trout, the smallmouth bass population has exploded in the past few years. The average smallmouth will range from 10" to 14" with a few going 16" and larger. Pickerel, rock bass, and fallfish are also caught quite frequently. The Lehigh is home to a smorgasbord of insect hatches. The Little Black Stones begin to show themselves in early-April and can hatch in tremendous numbers. If flows are decent and the water is clear, fish will key on these insects as they struggle to take flight. The end of April will see Little Black Caddis, Grannoms and Hendricksons, along with tan and green-body Caddis. During sunny days, Caddis hatches can really bring up the fish. May and June are "Prime Time" on the Lehigh. May brings fantastic hatches of March Browns, Grey Fox, Sulphurs and green-body Caddis. These hatches can bring up virtually every fish in the river. June still has some Sulphurs along with Caddis, but the Blue Wing Olives (size 14-18), Light Cahills and Isonychias will begin to make an appearance. As summer begins, Caddis still hatch in good numbers along with small Blue Wing Olives, Isonychias and the summer Stenonemas (Sulphurs). Mornings can produce good hatches of Tricos in the Lehighton to Bowmanstown stretch. As fall begins, Isonychias and evening hatches of Sulphurs can be outstanding. Caddis and Blue Wing Olives will be the flies the fish will key on as late fall approaches. Fishing with streamers and Wooly Buggers can be quite productive during this time of year as well. In fact, Wooly Buggers and streamers fished with a sinking line will produce fish all year long. Along the course of the Lehigh there are a few local conservation groups that stock the River from the bottom of the Lehigh Gorge to Northampton. 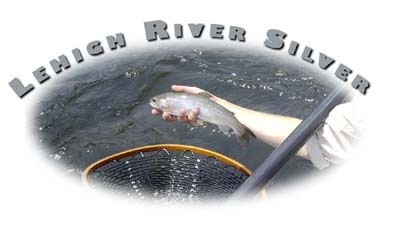 One of the largest groups is the Lehigh River Stocking Association (LRSA). The LRSA stocks thousands of trout in this stretch each year, ranging in size from 11" to 28." Besides fish stockings, the LRSA conducts numerous water quality studies, river cleanups, acid mine drainage reduction projects as well as educating the local residents on environmental conservation. We highly suggest supporting the LRSA! Please help in preserving our cold-water resources. Most agree that the Lehigh is truly a magnificent river with characteristics of a big western river. The scenery and abundant wildlife along the river alone are worth the trip. At times it is hard to believe you are only an hour from the suburbs of Philadelphia. Isn't it time you checked out the best kept secret in Northeastern US fly fishing? If you are interested in experiencing the "Madison River" of the East, feel free to give us a call or shoot us an email.